← Quick announcement about t-shirts – and a 2010 Reunion update! Many thanks to Gary Knapp for sending me this land plat map of the land around Randolph, Portage County, Ohio. You can click on the thumbnail picture to see a larger version of the map. This is just a slice of the entire document. I will post the rest of it out on the Picture Gallery later today. St. Joseph Catholic Church: Center of the Knapp’s existence, where almost all of them were christened, married, worshiped and are buried. 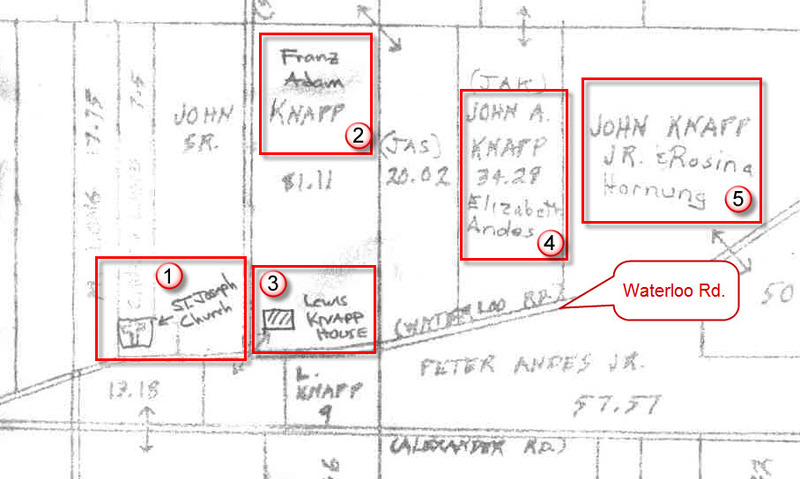 Franz Adam Knapp Farm: Our immigrant ancestor lived just down the road from his younger brother, John Adam Knapp. Lewis Knapp House: This is the farm of Lewis J. Knapp, father of John Lewis Knapp. He lived here with his wife, Mary May Knapp. This is where John L., Eugene, Clotilda, Beatrice, Hubert, Estella and Raymond all grew up. John Adam Knapp and wife, Elizabeth Andes Knapp’s Farm: This is Franz’s younger brother. This John Adam Knapp is not to be confused with John Adam Knapp, Franz’s only son. How do I know this was Franz’s brother and not his son, you may ask? Because Franz’s son, John Adam, married Agnes Trares, not Elizabeth Andes. Yes, there are a lot of John Knapps in this family! John Knapp Jr. and Rosina Hornung/Horning’s Farm: I don’t have much information on this family. John Adam Knapp had a son, John, but according to my records, he married Elizabeth Schroeder, not Rosina Hornung. So I am still working on this connection. I also noted Waterloo Road which runs in front of all of these properties. Plat maps are a great source of information. Since people didn’t travel too far from home in those days due to the limitations of horse-drawn transportation, people tended to marry the children of neighbors. You see the same family names cropping up all over family trees. Many of these connections go back several generations. This entry was posted in Family History, Local History, Maps, Portage County and tagged Knapp, land plat map Randolph, Ohio, Portage County. Bookmark the permalink.